Faceted stone jewelry is a perennial--like the little black dress, it is enduring and ever popular. Of course, manifestations such as bold crystal-encrusted styles are seen from the runway to the red carpet. Look for geometric shapes, tassels and jewel tones to mark this glamorous look. The look is luxe, but not formal--channeling expensive jewels, while remaining attainable with high-end look-alikes such as plated metals. Whether dressed up or worn with jeans, these bejeweled accessories are a versatile statement. If somebody said to you "faceted crystal" as a clue in some word game, you may reflexively reply "Swarovski." That's because Swarovski faceted crystals stones are well-known, cherished and used around the world. The selection of breathtaking, glamorous rhinestones offers a galaxy of faceted gemstones to achieve both a timeless and trendy look. Searching for inspiration? 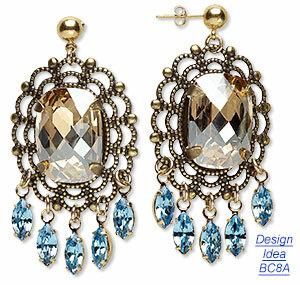 Look to vintage jewelry such as brooches and clip-on earrings featuring large faceted crystals. Faceted crystal of all shapes are popular, but long baguette crystals are especially of-the-moment. To put a contemporary spin on this vintage look, use oversized focal stones, or a bevy of small mismatched stones clustered together. To create your own faceted crystal jewelry, use fancy stones or pre-set components such as montèes and links. A cluster of jewel tone crystals and dramatic double tassels make a stunning combination. The swaying motion of tassels has long been viewed as captivating--even exotic. 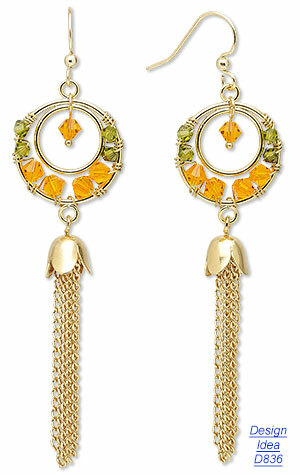 Natural attention grabbers, earrings designed with tassels are certain to evoke compliments. Baguette-shaped crystals give these earrings contemporary shape and glamour. Swarovski crystal and gold-plated brass spacer bars feature faceted rectangles ideal for geometric-themed jewelry designs. Simply add earstuds for a quick and easy on-trend earring set. 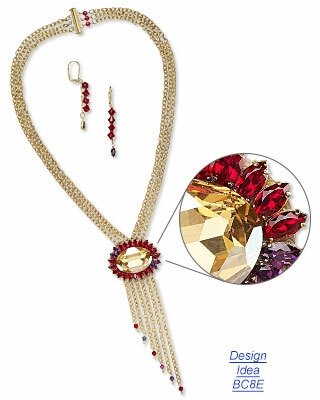 A bold center crystal has added drama when paired with red marquise-shaped crystals and chain fringe. The machine-cut precision facets of the focal, beads and drops provide a standout geometric look, and the gold-finished steel cable chain enhances the uniform style. 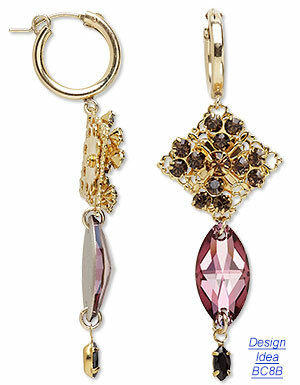 Deep purple crystal drops add drama to gold filigree components in these sparkling earrings. Pear, marquise, navette and square faceted crystals create a jumble of geometric exactness. The look is an interesting blend of sleek, elegant and bejeweled. 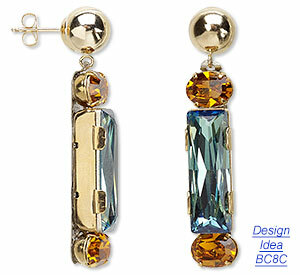 Vintage style takes center stage in earrings that feature delicate blue crystal drops and golden center faceted stones. Antiqued gold-plated brass softens the exacting structure of the faceted crystals. Dangling drops add unexpected motion and a flirty bit of luxe.